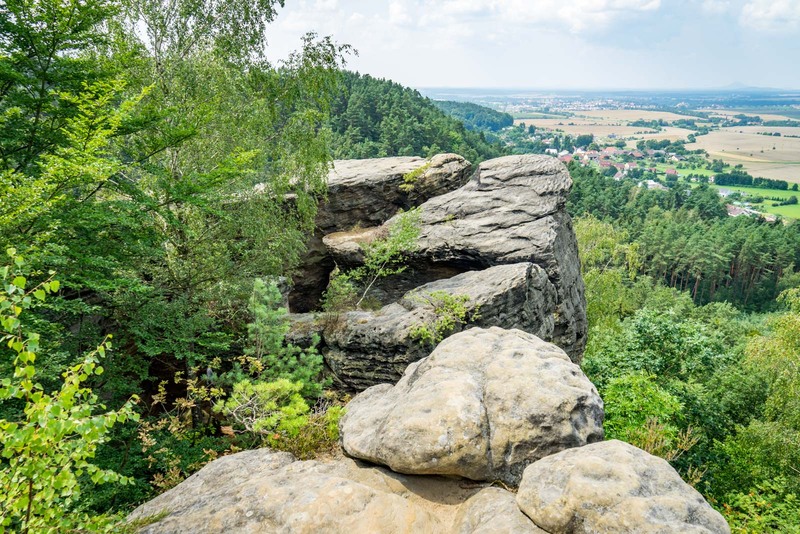 The best way to visit Bohemian Paradise - including the top hikes! 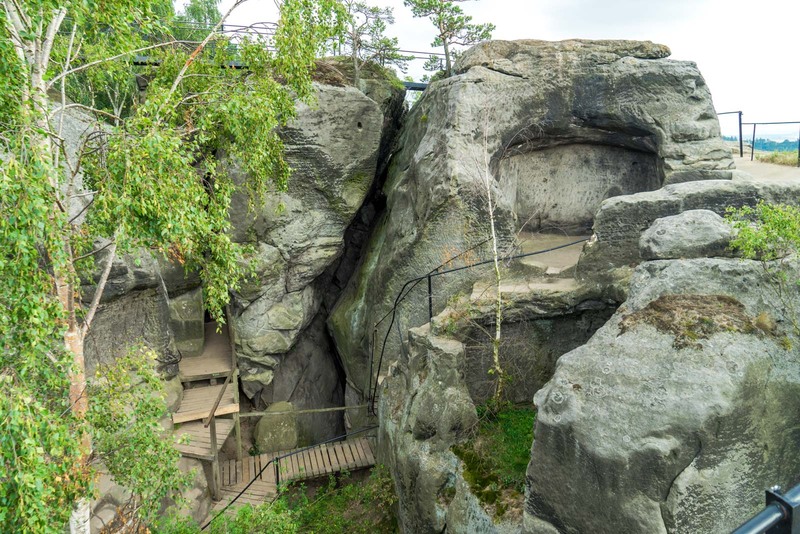 This wonderful natural area is an easy trip from Prague. The Bohemian Paradise is great for hiking but there are lots of other things to do here too. The idea of bohemia conjures up a sense of art, of freedom, of carefree inspiration and head-spinning euphoria. The bohemian culture swept through Europe in the nineteenth century. Artists, musicians, writers, performers. Probably impoverished (or at least pretending to be), socialising with kindred spirits, perhaps being free with the love, and possibly free with the substances that make you love. This is the Bohemia I imagine. But is it what I find when I actually go to the place that claims to be the paradise of Bohemia? Well… sort of. Bohemia is the name of the largest region in the Czech Republic. The reason the artistic movement borrowed the name is because the lifestyle started in the lower class areas of France where many gypsies lived, and these gypsies were thought to have arrived from Bohemia, the region I now find myself in. Bohemia, as a region, is large and contains many of the sites I have already written about – Prague, Česky Krumlov, Litomyšl. But there’s one place I want to focus on today. It’s called Bohemian Paradise. 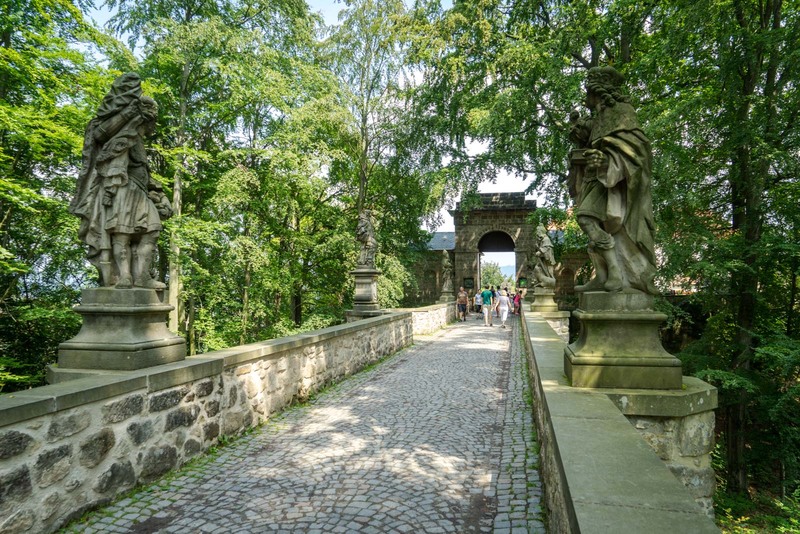 Head northeast of Prague for about 100 kilometres and you hit Bohemian Paradise. 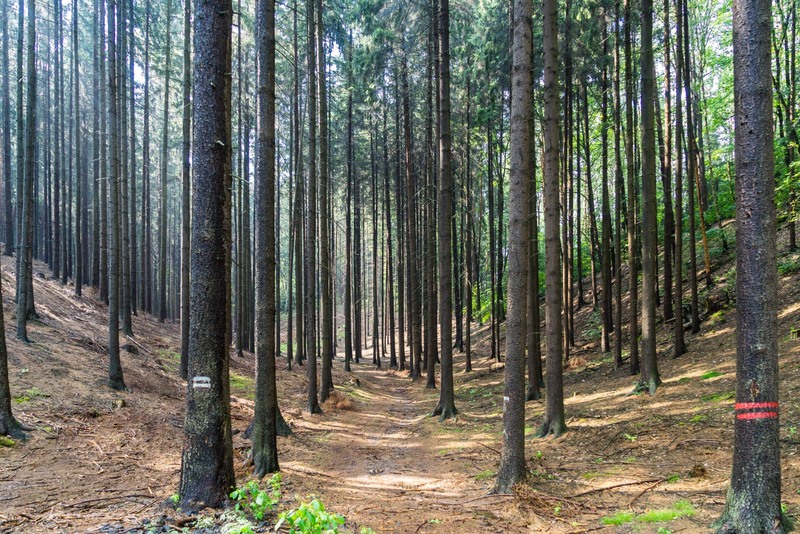 It was the first nature reserve in the Czech Republic and has been expanded in size over the years. Throughout the park is a network of hiking trails that lead through large tracts of beautiful forest. There are flat plains on the outskirts, closer to the main roads that encircle the park, but, as you go in deeper, the paths take you into mountains and around cliff edges towards the centre. Throughout it all are palatial old houses, castles, pubs, ruins, picnic areas, lakes… and constant discoveries. 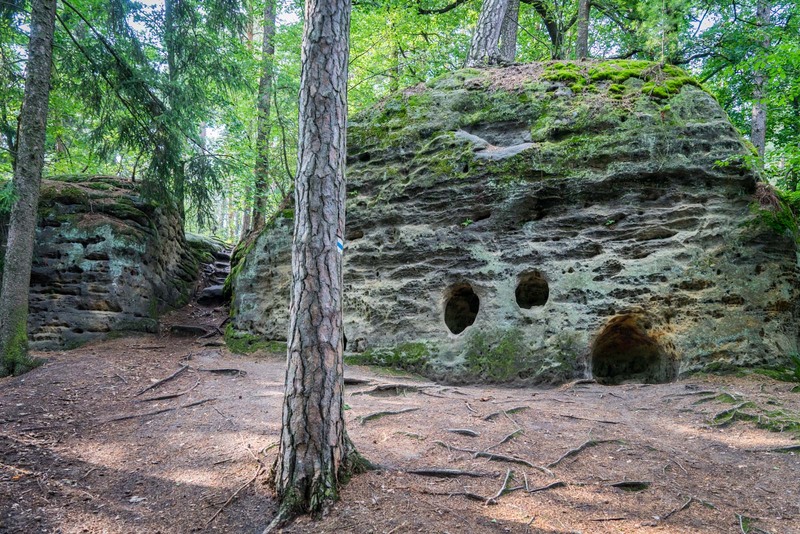 What I think makes the area so special are the rock formations that you also find amongst the forest. Tall towers of sandstone that have been battered by the weather for countless years and moulded into unique shapes. They look like fingers on a hand, like petrified trees, like watch towers, or the turrets of castles. In fact, some of them have actually been turned into castles. I find one of these old castles that has been made out of the natural sandstone towers as I begin my first hike in Bohemian Paradise. There are a lot of hiking trails through the park and surrounding area and you can plan to do walks of any length you like, mixing and matching the paths you like at the numerous points where they intersect. I had trouble doing planning in advance because there is very little official information online. However, if you pop into one of the tourist information centres in the nearby towns, you’ll be able to get a good map. There are also signs along the trails with maps. And the paths are marked with different colours to help you navigate. There is also a great tour company that will guide you to all the best spots. You can see the details of the tour here. If you’re interested in organising your own hiking while you’re in the area, I am going to suggest two options to get you started. I did both of these and I think they’re a nice length and take you through a good variety of what there is to see in Bohemian Paradise. Both of the trails are marked on the map below that I’ve put together. If you’re using your smartphone, just click on the icon in the top right to open the map in your Google Maps app. 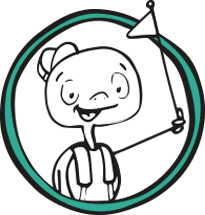 Then, as you are walking, you’ll be able to trace your path with the GPS marker. This hike is a loop so you could start it from anywhere, but I think the most convenient place is from Dneboh. It is about 13 kilometres long and will take about four hours. There are a few uphill sections and also some great places along the way you’ll want to stop and explore. For instance, right about the town of Dneboh, you’ll find the castle in the rocks. This complex of stones creates passageways between them. Climb up the ladder and you’ll be on the peaks, using gangplanks and more ladders to get between, with amazing views across the lands below. 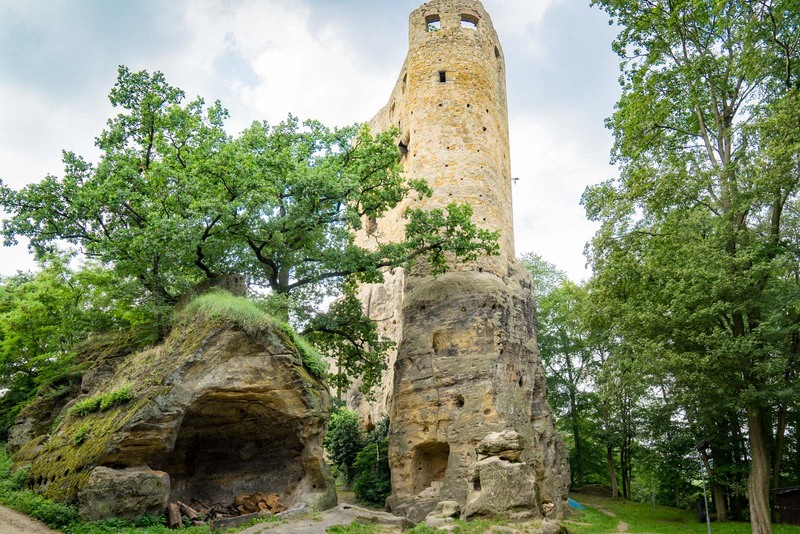 A bit further along, just south of the town of Zásadka, is another castle built within one large piece of stone that you can go inside and climb to the top. You’ll go through forests and fields, up and down slopes. 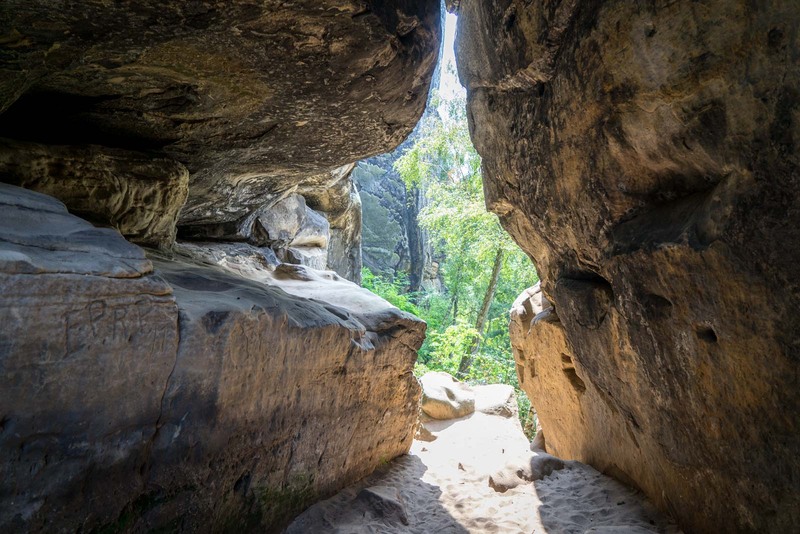 There will be caves and other signs of ancient human activity in the rocks. Finally you’ll finish with some incredible views of the rocks from the cliffs before you descend back to Dneboh. Then, at the end (or the start, for that matter), there’s a nice little hut that serves cold beer and hot coffee. You will want it by then, I’m sure! 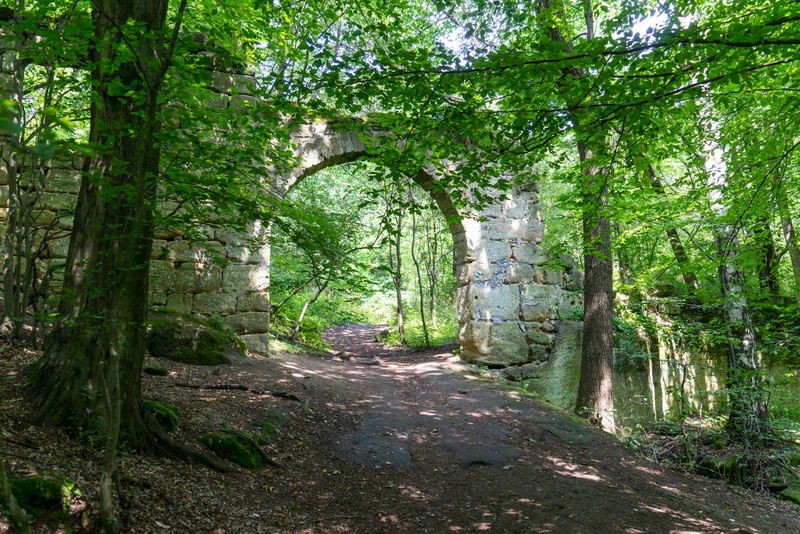 This hike is one way between the city of Turnov (which has very good transport connections) and the small town of Hrubá Skála (which is connected by bus and train back to Turnov. You can do it in either direction. 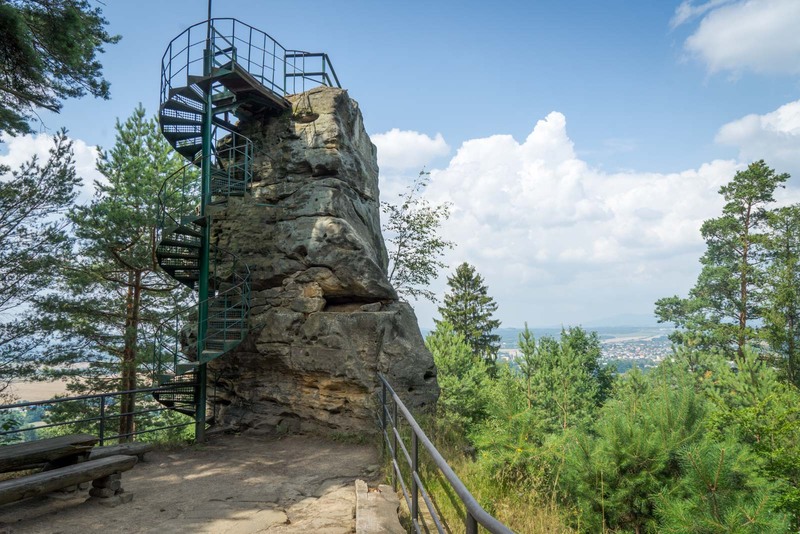 From Turnov, you rise up into the mountains and reach a viewing tower built at the peak. From there, it’s just a short walk along to the Valdstejn Castle. This is an attraction in itself and you can buy a ticket to go and in look around. Further along this trail, you’ll come across a few places which are marked as viewpoints for the spectacular rock formations. The most famous one is probably of the ‘band leader’ and the ‘band’, as they are called (but in Czech). At the Bukovina Arboretum, you’ll find a small but very friendly pub that serves a hearty lunch and cheap beers, if you’re ready for a bit of a break by this point. But just a little further on is the large Hrubá Skála Castle. This is also a hotel and there are shops and cafes here. From this point, you can walk down to the train station (or bus stop) at Hrubá Skála, as I have marked in the map. As an alternative, if you’ve still got some energy, there’s a lovely path through more forest and past a lake, that will take you to Borek train station. You could even go a bit further and make it to the famous Trosky Castle, spread across two crags. The walk without the extensions is about 10 kilometres and should take about three hours. So, before I finish, I guess I didn’t tell you the answer to that question I posed at the beginning. Did I find the bohemian ideals here in Bohemian Paradise? Well, it wasn’t a smoke-filled Paris apartment with painters and musicians waxing lyrical about love. But it was inspiring in its beauty, and it was carefree in its seemingly endless paths. I did feel, as I walked in the forest or climbed up the sandstone towers, that I had freedom. And I found such pleasure in the aesthetics that I often thought of nothing else but the vista in front of me. And, in a way, when you get down to the core of it all, that’s what bohemia is really about. 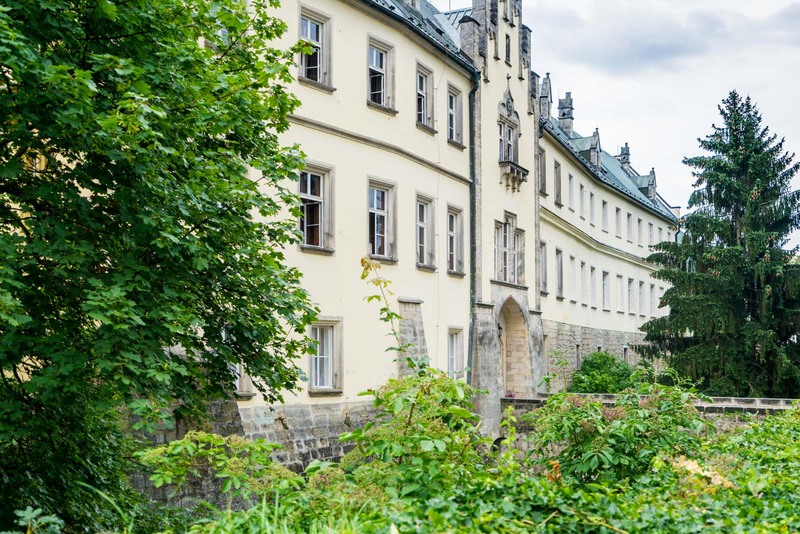 Where's the best place to stay in Bohemian Paradise? If you’re travelling by public transport, you're limited to the bigger towns for accommodation. I would suggest looking at either Turnov or Mnichovo Hradiště. For an affordable room above a friendly restaurant, try Hotel U Hroznu. For something a bit more upmarket, Hotel U Kvapilů has wonderful rooms in the town centre. Or if you're travelling in a group or need some extra space, Apartmán Skalka is a great option. I come from the Czech Republic and I couldn’t agree more with these ideas! It is a paradise country for hikers! Thanks – useful tips and good photography. Hard to decide between the two. One thing that would help is where to find info on the schedules between Hrubá Skála and Turnov. We’re a little worried about getting stranded. Hi Sara. You won’t have any problems with a 1 year old on these hikes. They are all easy tracks (some people had prams on some of them). Any steep bits that are slightly tricky are very short. My pleasure! I’m so pleased you found them useful. Please let me know if you have any feedback or tips that you’ve discovered yourself on your hikes! My husband and i will have 5 days in Czech republic after we leave Prague. We want to hike/hike and get away from. Large towns. Prefer smaller places. Can anyone advise us on how easy it is to navigate around by public transport. 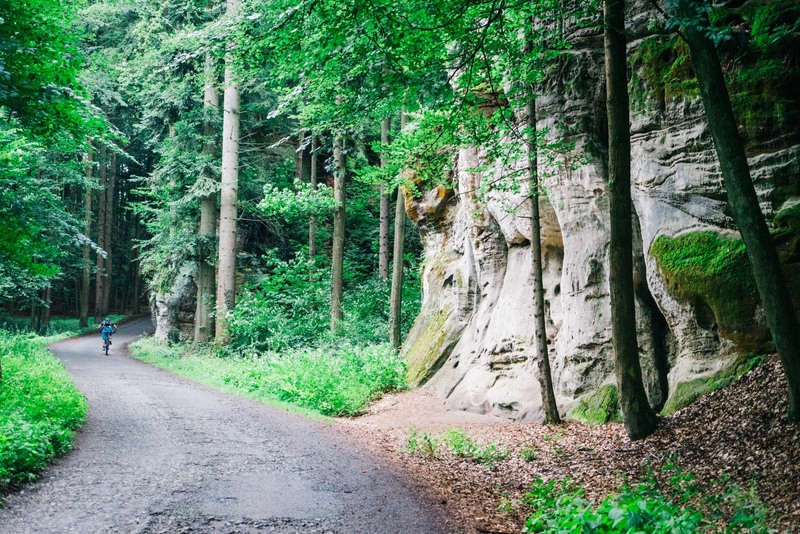 We are not sure if bohemian Switzerland is easy to get to? Or maybe another national park is easier to get to? Hi, If you like visite Prachov Rock City from Prague it is possible to go by bus to Jíčín and then to Prachov. The connection is not perfect and takes it little longer. Or I have small outdoor company and I do hiking and biking tour out of Prague. 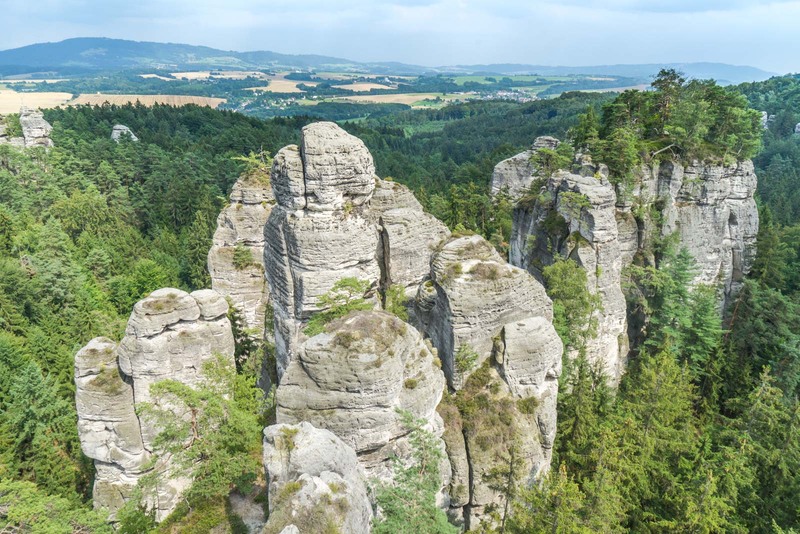 Mostly to Bohemian Paradise Geopark and Bohemian Switzerland National Park. Have a great time in Prague. Thanks Lucas! I have added the links to your tours into the blog post so people can find you if they’re interested in checking out Bohemian Paradise with a guide. The tours look great! Hi, I am a Czech and I can recommend you an online map for planning the hikes – mapy.cz. It is available as an app, in English too, and if you switch the map type to Touristic, you can see all the trails :). The whole country is connected by them. I will be traveling to Prague with my husband for a week arriving Oct 5 or 6. We want to do several days of hiking, day hikes, somewhere less “touristy” where we could stay a few days. We are both in our 50s, aiming for 4-6 hour hikes. I am feeling overwhelmed at where to go; there’s so much-and our time to go is getting close! 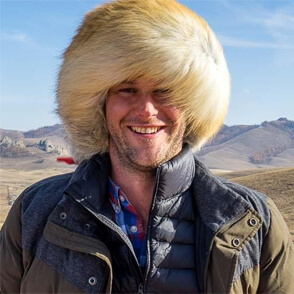 I want to go somewhere where we are less likely to be with crowds of people I felt like finding your website was SO HELPFUL; but still wonder if you could hike in one place that is accessible (within 4 hours of Prague) where would it be? Bohemian Paradise–? Do you have other suggestions? 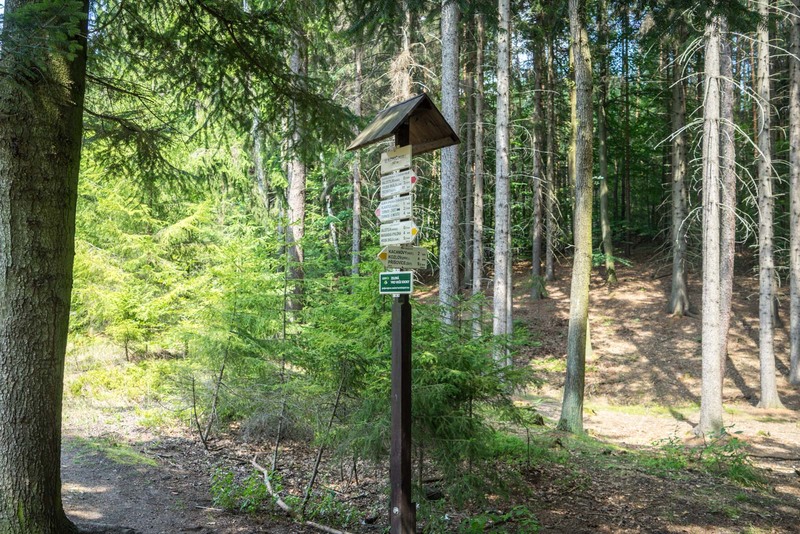 is there somewhere to hike near česky Krumlov that you would recommend? 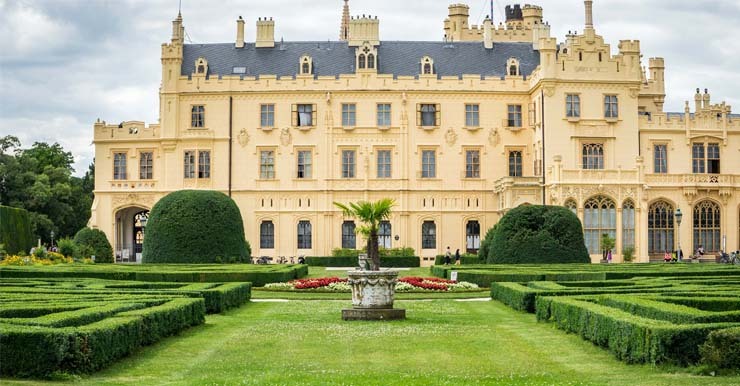 Both of these walks look great, and I am also really interested in the Karlstejn trail. Do you think I should book my trains in advance or just buy them on the day? I will be going this weekend. This year I would be able to visit the Bohemian Paradise in July or August. I’m concerned about both hot temperatures and crowds on the trails. Would I enjoy making the trip in July/August, or would you recommend that I wait another year to come another time of year?